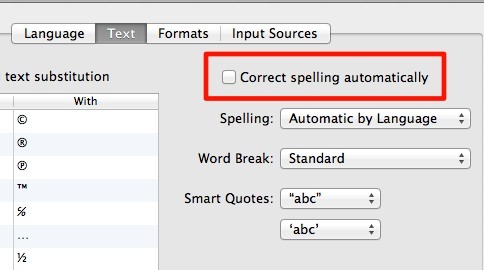 You might have noticed the “Auto Correct” feature of OS X Lion. It’s really helpful but at times it becomes simply annoying. For example, when I tweet I do not want my tweets to be auto-corrected. You might want to turn off this feature cause it tries to auto correct tech terms, slang and many other obvious terms. In the search box type “Launguage & Text” and open it. In the Text tab , un-check the option which says “Correct Spelling Automatically“. See the image below.